Takes 2 months only to get relieve. It takes 2 weeks only to see results and stop using inhalers. It does not matter how chronic your Asthma is or how long you have been having it. We will help you get over it and restore back your health free from inhalers and drugs. Asthma occurs when the airways in your lungs (bronchial tubes) become inflamed and constricted. 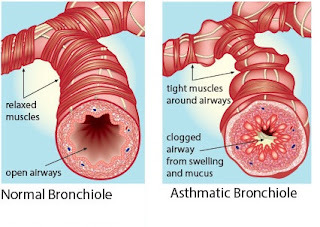 The muscles of the bronchial walls tighten, and your airways produce extra mucus that blocks your airways. Asthma is triggered by exposure to allergens and irritants that trigger attack. These does not cause Asthma. They trigger Asthmatic attach for those with asthmatic Condition. Asthma is known to occur in some families and can be passed on from one generation to another. It is associated with family genetic profile and that’s why doctors will ask you if there are other members of your family with Asthma. Asthma affects family members who have ‘poor immunity’ brought about by their genetic profile. Also people without a family history of asthma can get it if their immune system is weak. When immunity is low, the body becomes an easy target of infections such as drug resistant staphylococcus aureus. According to our observations 98 % of asthmatic cases are caused by infection of the airways by a bacteria known as staphylococcus aureus. This bacteria is classified as a super antigen and is a multi antibiotic drug resistant bacteria that affects people with poor defense or immunity. It is easily treatable in our clinic by administering appropriate immune booster and natural antibiotics. • Bouts of coughing or wheezing that are worsened by a respiratory virus such as a cold or the flu. Asthma may cause a number of complications some permanent. The earlier the treatment the better. • Side effects from long-term use of some medications used to stabilize. • Congestive heart failure or vocal cord problems. In children, it can be hard to differentiate asthma from, pneumonia or reactive airway disease. In order to rule out other possible conditions, our doctor will do a lab test and physical exam and ask you questions about your signs and symptoms and about any other health problems. NB. Our consultant herbalists have a background in medical training. Asthma can be treated completely contrary to believe that you will rely on medications to relieve symptoms and control inflammation the rest of your life. •	Perform physical and diagnostic Laboratory tests to determine the real cause of your asthma. •	ask you questions about symptoms such as how often you have asthma attacks and how bad they are, Aggravating factors such as dust, animal far, environmental, foods etc. •	Give you the collect natural supplements such as immune booster and natural antibiotic which can treat Staphylococcus aureus and advice you on the best diet. Asthma treatment takes from 1 to 3 months time depending with severity and the causing agents. Avoid your triggers. Taking steps to reduce your exposure to things that trigger asthma symptoms is a key part of asthma control. Some of our natural remedies for treating Asthma have so far been scientifically proven to relieve Asthma completely. These are Prunus Africana, Warbugia Ugandensis, Eucalyptus, etc. Contact us for more information. Our doctors have medical credentials having undergone training in recognized institutions.